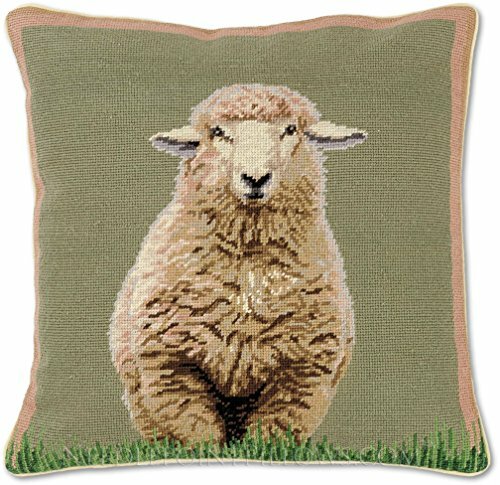 Handmade 100% Wool Decorative Needlepoint Farm Barn Nature Animal Ranch Sheep Throw Pillow. 18" x 18". Heirloom quality, handmade needlepoint made with 100% wool. Coordinating soft cotton velveteen on reverse witrh hidden zipper for easy cleaning. This limited edition handcrafted pillow measures 18" x 18". Manufacturer: Richard Rothstein & Co. Publisher: Richard Rothstein & Co. Studio: Richard Rothstein & Co.